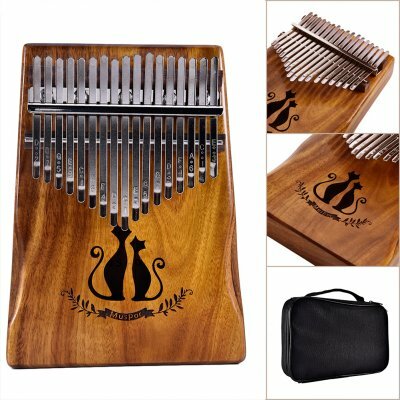 Successfully Added 17 Keys Kalimba African Solid Mahogany Wood Thumb Piano Finger Percussion Gifts(Couple Cat) to your Shopping Cart. Laser engraving phonetic symbols, simple identification of phonetic symbols. Kalimba, also known as Thumb Piano, is a new type of instrument originated in Africa. Muspor Kalimba metal keys are mounted on a solid wood box, acts as the resonating chamber. You could play songs easily by pulling keys. A simple operation can learn a minute. It's recommended for travelling, party, relaxing etc. Easy to learn:1(D), 2(B), 3(G), 4(E), 5(C5), 6(A), 7(F), 8(D), 9(C4), 10(E), 11(G), 12(B), 13(D), 14(F), 15(A), 16(C6), 17(E), international standard C key.